Christian Riese Lassen's visionary images speak volumes about his deep reverence for the planet Earth and his respect for the harmony of life found in nature. 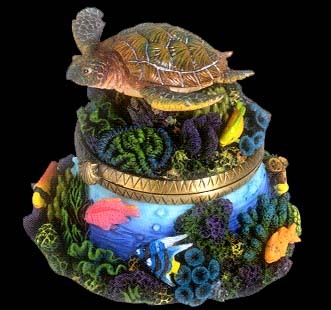 This Christian Riese Lassen Turtle Trinket Box comes alive in stunning detail as a true work of art. Whether it is your first piece or one of many in your personal collection, it will bring you and your family a lifetime of pleasure.